Dental veneers (sometimes called porcelain veneers or dental porcelain laminates) are wafer-thin, custom-made shells of tooth-colored materials designed to cover the front surface of teeth & to improve your appearance. These shells are bonded to the front of the teeth changing their color, shape, size, or length. 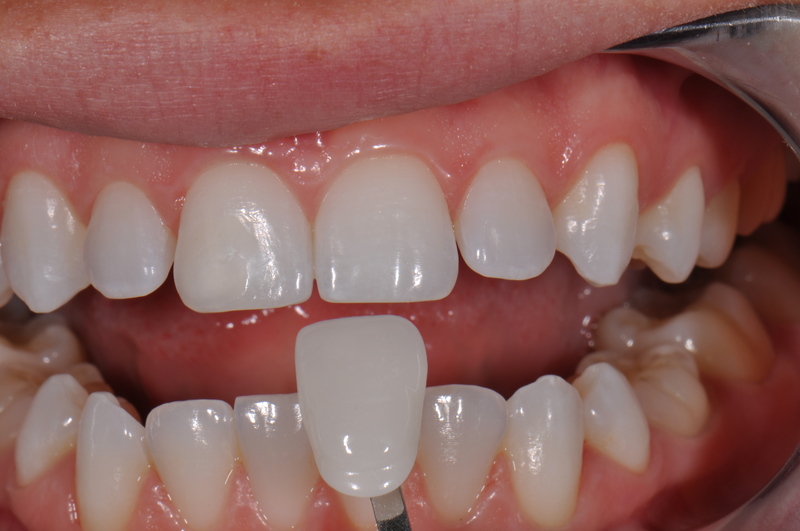 Dental veneers can be made from porcelain or from composite resin materials. Porcelain veneers resist stains better than resin veneers and better mimic the light reflecting properties of natural teeth. Resin veneers are thinner and require removal of less of the tooth surface before placement. Our dentist at FDOC will help you to decide the best veneer material for your teeth. When is veneer indicated for you? Diagnosis and treatment planning. Our dentist will examine your teeth to make sure dental veneers are appropriate for you. He or she also may take X-rays and possibly make impressions of your mouth and teeth. To prepare a tooth for a veneer, our dentist will remove about ½-1 millimeter of enamel from the tooth surface, which is an amount nearly equal to the thickness of the veneer to be added to the tooth surface. For very unsightly teeth, temporary dental veneers can be placed. Bonding– Before the dental veneer is permanently cemented to your tooth, your dentist will temporarily place it on our tooth to examine its fit and color. A special cement is applied to the veneer and the veneer is then placed on your tooth. Follow-up appointment- Your dentist may ask you to return for a follow-up visit in a couple of days to check how your gums are responding to the presence of your veneer and to once again examine the veneer’s placement.